White South Sea pearls and golden South Sea pearls are produced by the Pinctada maxima oyster, along the coast of Australia, Indonesia, Philippines and Myanmar. Their large size, extended growth period, limited culturing area, all combine to make. South Sea pearls the most expensive of all pearl types. The growth period is approximately 18 to 24 months. They come in a range of colors from silver-white, white-pink to champagne and dark golden shades. 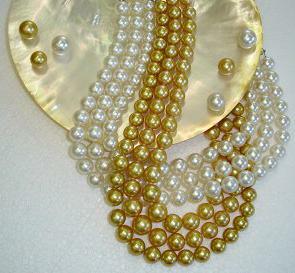 These pearls have an average size of 9mm to 18mm diameter. Pearls over 19mm are very rare in gem quality. The shapes are divided in round, oval, button, tear drop, baroque and circled.